On what was a disappointing day for Indian cricket, the men’s cricket team suffered the same result as their women counterparts, going down by a gigantic 80 runs at the Westpac Stadium in the series opener. After failing with the ball earlier in the day, allowing New Zealand to take them apart and notch up an extremely daunting 220 run target for them, in an unprecedented batting display, India was knocked down for just 139 runs to give New Zealand a comprehensive 1-0 lead in the series. 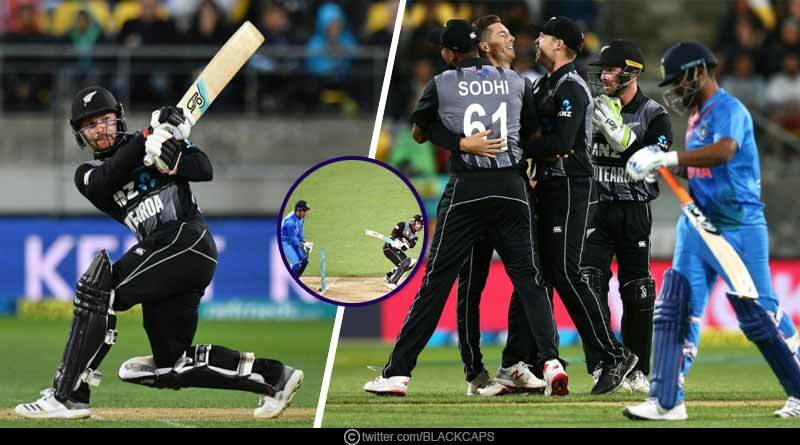 Coming back to New Zealand Vs India First T20, both the sides announced heavily reshuffled playing line-ups at the toss but it was a decision that only worked for New Zealand with all their new faces stepping up to deliver big time for them. For the Indians, the fringe players failed to make the massive opportunity count, faltering to do what they were brought in for, becoming one of the major reasons for India’s beleaguered performance on the day. Going into the encounter with only Bhuvneshwar Kumar as the stand-out frontline spinner and just the one spinner, India has already compounded the problems on themselves even before delivery was sent down. The New Zealand opening pair of Munro and Seifert took no time in setting the tone for the match, taking a special liking to Ahmed who yet again endured a horrid time in the middle. We were unabashedly taken apart by the duo with Munro sending him for two sixes in the fourth over to get the hosts off to an effervescent start. With the field restrictions in play, New Zealand needed no second invitation to play their shots. While Munro has always enjoyed playing against India, Seifert who was opening for his side for the first time ever in just his second T20 international took India apart in a bashful style. Helped by the Indians erring in line non-stop, Seifert played stroked all around the park with no bowler being spared. He put on 84 and with Munro getting 34, the opening partnership had taken the score to 86 in just 8.2 overs. Williamson took off from where Munro had left with him and Seifert ensuring that NZ’s momentum didn’t dwindle despite India’s first breakthrough. The 48 runs stand for the second wicket was worth its weight in gold, not allowing India and breathing room in the encounter with the home crowd being treated to some absolutely gorgeous and elegant shots as the pair lofted the ball effortlessly above the fielders to hit boundaries at will. India did have a small period in the match when it looked like they could pull back things well within the 200 region with 4 wickets falling for just 27 runs but the final two overs ended their dreams with Bhuvneshwar (1-47) and Khaleel (1-48) both failing to deliver the goods in the death overs, making it all too comfortable by bowling in just the hitting zone. Coming out to chase, India knew they needed an incredible and huge stand at the top if they were to have any chances of registering their first ever win in the country. It failed to happen though with Rohit departing for just 1, castled to bring an end to an innings that looked extremely iffy and worrisome. India’s plan to send Shankar in at number 3 was another perplexing decision from the team management. While he and Dhawan managed to hit some shots to the fence in the power play overs, New Zealand’s spinners pegged India back, bowling persistently at immaculate trajectories to see India go down from 51-1 to 139 all out. The middle-order walked in and walked back to the pavilion ever so quickly with all of them just looking to throw their bat away at everything rather than actually construct a proper inning. Pant (4) and Karthik (5) saw India sit at 77-6 with the match just a mere formality away from New Zealand, one they sealed by getting the entire Indian batting line-up all out. “Fantastic performance all around. One of the complete performances you search for. Seifert was excellent. The bowling performance was outstanding. We had runs on the board but bowling and fielding were outstanding. [On the women’s game] It was a great game. Throughout the series, the two teams have followed a similar trend. Hopefully, they can do that in the next game and we can follow it up.”, said Kane Williamson.